It was standing room only as Plug and Play San Diego selected five seed-stage tech companies to participate in its startup accelerator program, following presentations by 17 finalists yesterday at the Co-Merge shared workspace in downtown San Diego. The afternoon session represented Plug and Play’s third draft of companies in a San Diego-based selection process that attracted a record 92 entries, including startups from Denver, CO, and Tijuana, Mexico. 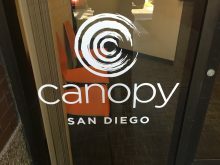 Organizers said the size and diversity of the field was encouraging, and reflects a noticeable increase in early stage startup activity among tech companies in San Diego. About 75 startup founders and supporters filled the conference room to watch the presentations. A year ago, when the San Diego satellite program selected its first group of local startups, “We didn’t have a point of reference, and now we do,” investor Alex Roudi said. Thanks @bvbigelow for this great overview of #PNPSD and selected startups. The bench of talent is deep here in San Diego and Silicon Valley recognizes that our startups are solving some of society’s most difficult and important problems.